How did I get hooked on these things? I was reading a blog by the mother of (I think) an American family who had been living in Japan. And she was hooked on suction cup hooks. I've never seen them in Australia, but they are now an essential part of my life. Anyway, for your information, each hook can hold up to 1kg when properly attached. It has a lever which you flick down which tightens the grip of the suction cup. 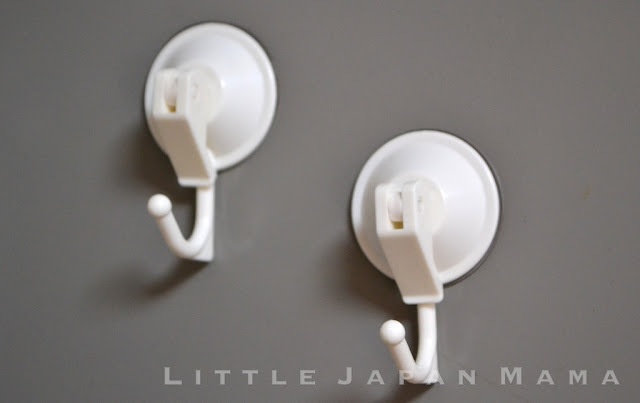 Would you like to tidy up your kitchen and bathroom with these hooks? (I had to try really hard not to write a sentence that uses "hook" as a verb, there.